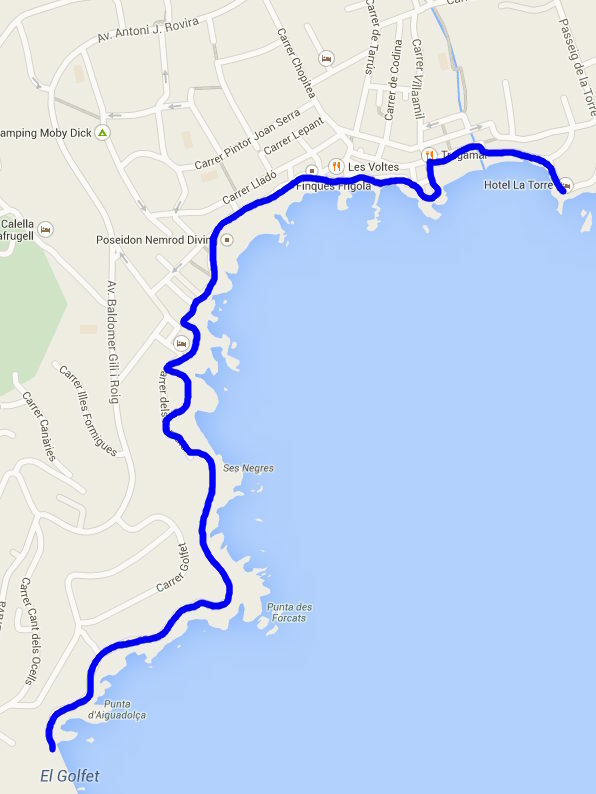 We covered the walk from Far de Sant Sebastia (Llafranc) to Tamariu two Januaries ago but at the time part of the GR92 path was closed due to construction works and the weather was a little overcast. I added an update to the original to say the path is now open, but until now haven't updated the pictures, so this weekend we took advantage of the sun and recompleted the stretch from Tamariu to Llafranc, this time going all the way in and out of Cala Pedrosa to complete the coastal part of the walk. The bath is popular out of season, particularly on a gloriously sunny January Sunday and there were lots of families taking at least the first part of the route to the rocky bay and barraca just around from the main Tamariu beach (great for rock pools in the summer). It was good to run into German and English walkers too as the Costa Brava really is a fabulous winter destination for a little sun and good hiking. 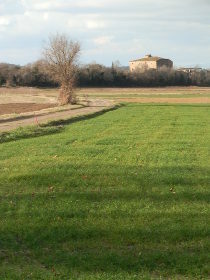 The main part of the walk which was closed last time runs at the back of two new villas and has been done up very well. 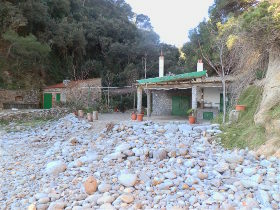 The path now consists of a wooden gangway at the back of the houses above a small rocky cala, one of the classic Costa Brava inlet type coves with no access other than from the sea. The wooden gangway turns into a small walled path which a bit uneven where water has washed away the top of the path leaving some pipework exposed. 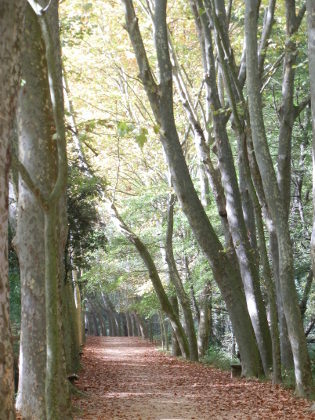 This path then curves into the woods around La Musclera. The route then climbs around the Musclera headland, getting quite high above a cliffside before connecting to the path down to Cala Pedrosa. This particular path goes steeply down the hillside along a narrow cliff-side path with wooden barriers/bannisters all the way down to the Cala. It's not difficult, but it is steep as it zig-zags up the side of the bay. At the bottom, we reach a large bay filled with large pebblestones. 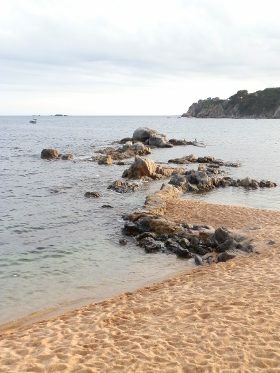 Pedrosa means stony or rocky and the pebbles are chunky inviting you to make pebble stacks or to try skimming the stones out across the water. At the back of the bay is a small house/bar that it often open in summer sometimes serving food straight off the barbeque. The path out of Cala Pedrosa runs along the stream at the back of the bay, through a shaded valley that was cool in the January air unlike the sunnier parts of the walk. At the top it meets a broader track/path at the back of a view houses before running past first fields and then woods up to the lighthouse (Far de San Sebastien) above Llafranc. 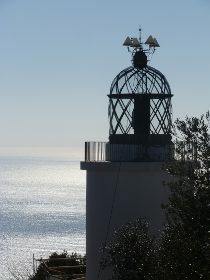 The lighthouse can be approached from two directions. The main GR92 path runs high above the sea and gets a little high if you're not comfortable with heights, before connecting to the watchtower next to the Restaurant de Far at the top behind the lighthouse. 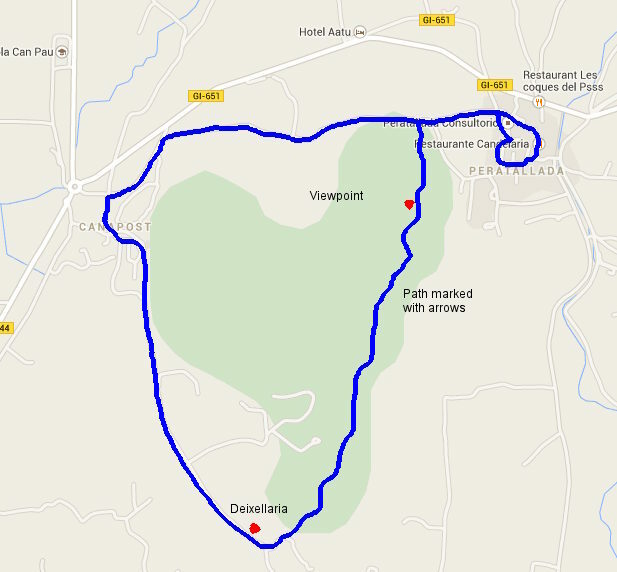 This time we turned right earlier, following a forestry track that connects to houses on the other side of the hill (Carrer Panama), then taking the road across the top of Llafranc. The views from the lighthouse are spectacular. As this was a particularly clear day, we could see the snow on the Pyrenees behind Palafrugell on one side and the coastline and beaches stretching away to the south past Palamos on the other. Tossa de Mar is one of the most famous towns on the Costa Brava because of its walled village next to the sea and beautiful bays. 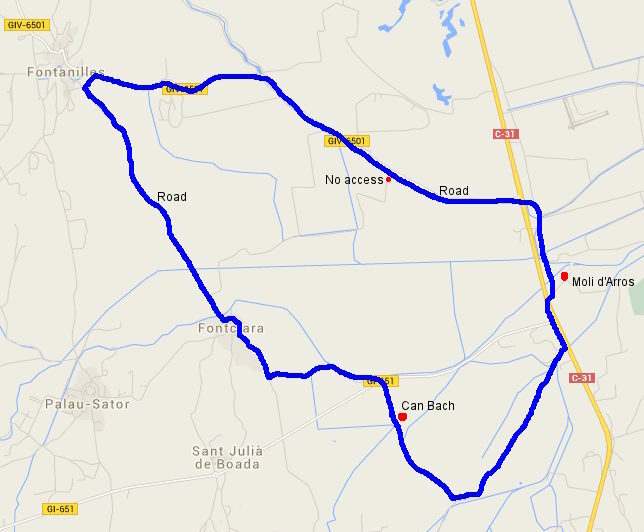 However, it has a relatively isolated location as it and Sant Feliu de Guixols are separated by a very windy road along the coast and the hills of the Massis de les Cadiretes. For walkers, the GR92 coastal path between the towns goes inland over the hills, while the coastal route up and down a number of cliffy calas is all road with no natural walking route. However, the road is extremely popular with cyclists (amateurs and professionals) as it's extremely scenic and too slow and bendy to be a main route for cars. 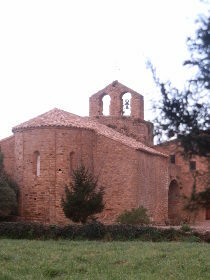 The Cadiretes hills therefore form a relatively isolated and empty wilderness between Tossa and Sant Feliu with remains of chapels and fortifications and a few scattered houses but not much else. This is a walk on the GR92 from just about Sant Grau - marked as the castle at Montagut (though we somehow missed the castle). 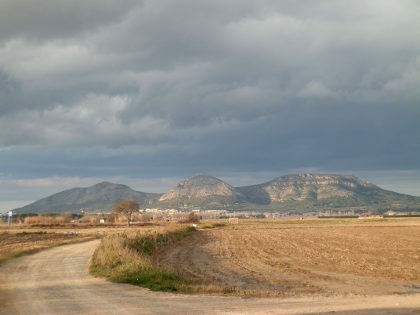 The first part of the walk has views inland towards Llagostera and Girona, and comes back to Sant Grau on the sea-view side. 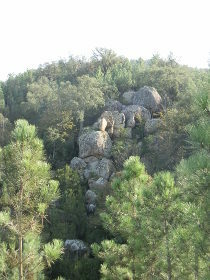 It's a fairly typical wooded walk with some interesting rock formations and some views because of the height, but would otherwise be relatively unremarkable except for the rave party we walked past. 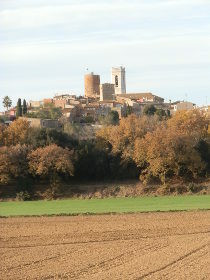 We arrive by car from Llagostera on the road to Sant Grau winding into the hills with a valley to our right. The area marked as the castle for Montagut has a track with a wide-ish entrance and space to park, so we stopped at the track. We were however surprised at the number of cars around. Initially we thought it was for hunting, as we'd just passed a collection of hunters with what looked like four or five boar further down the hillside. 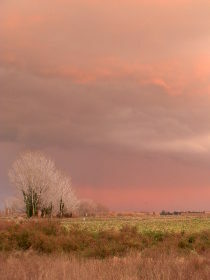 We start to walk along the broad gravel track and pass yet more cars and it becomes clear from the number of young people milling around and the slightly odd looks that we get that there we're passing some form of music gathering in one of the abandoned farmhouses. No doubt this was a one off, but it feels a little strange and incongruous for a Sunday afternoon stroll in the middle of nowhere and as we pass the last of the cars the music starts we find ourselves walking to the accompanyment of a bass-and-drum beat. 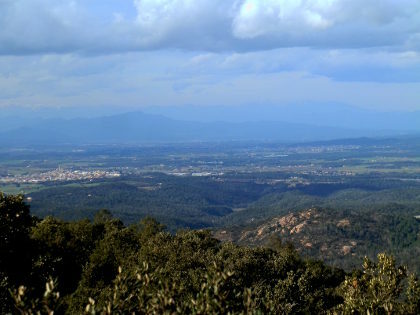 The track runs along the side of the hill with small mounds of rocks 10-20m high in places and from the top of the rocks, the view is spectacular out across towards Girona and Lagostera. The path is a fairly standard wooded path though without much in the way of other highlights. As we get towards our turning point (where the GR92 meets a local yellow-white sender), we can see the remains of a chapel just around the next bend in the hill looking back at us. However, we reach the junction first and so don't explore further, instead turning back towards the right across a small col and walking on the other side of the hill. From this side we now have views to the sea and across to some of the more isolated housing estates that dot the route between Tossa and Sant Feliu. 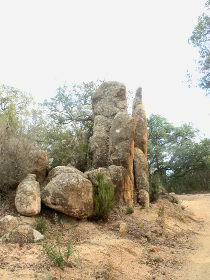 The walk is then a steady path that curls beside more strange rock formations before we get the sight of the church of Sant Grau above us. 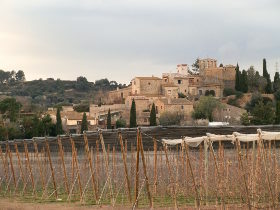 We curl around the hillside and across a small stream before what is a relatively sharp incline upto the village of Sant Grau. The village itself consists of the church with attached house, presumably as part of a monestary at one point and a scattering of old masias and a few isolated villas in the woods with views out towards the sea, quite a long way down below. The area looks like it was once ear-marked as a tourist development as there is an abandoned swimming pool overlooking the valley and a few unconnected roads abandoned before construction started. We take the road back. The map marks a couple of points just off the road, but we just head back. The road is quiet with no traffic. Towards the top we reach the connection to the GR92 once more and follow the path towards the telecom masts at the top of the hill expecting to find the castle of Montagut, but we miss it again. 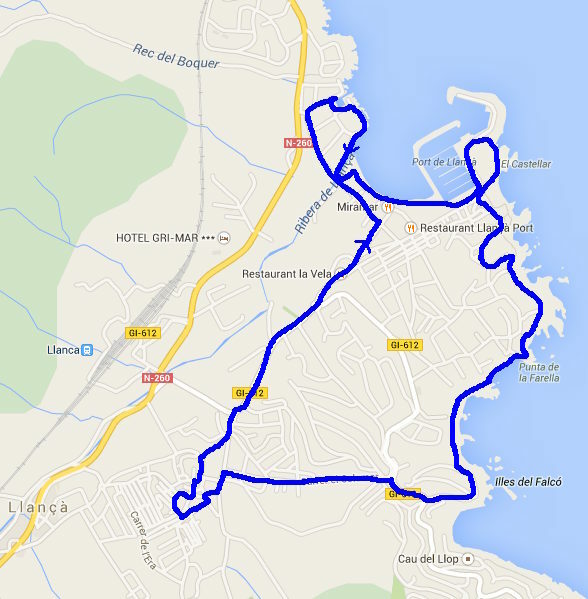 Back at the car we then take the hairpinned road down to the coast to get back via Sant Feliu de Guixols half giddy from the curves. In general, the walk was OK without being spectacular and lacked a little in terms of points of interest for the driving involved. This Christmas we headed off to snowier climes to meet up with relatives, but this meant that we needed to leave Zina our dog here as we were flying. She's not a special pedigree or anything sophisticated - in fact we got her from the Rodamon dogs rescue centre just outside Palafrugell when we moved here (they're always looking for dog walkers). However, perhaps because she was in dogs home, she's quite timid around other dogs and our one other experience of leaving her at a dog kennel (Elena's near Regencos) in summer wasn't very positive. 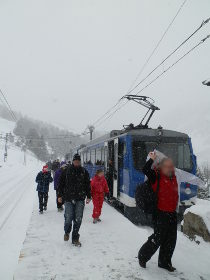 So it was with some trepidation that we booked her into the Centre Cani de Pals over the winter break. However, this time the experience was much much happier. The Centre Cani de Pals is both a kennels and dog training centre with a strong sense of care and affection for the animals. The dogs were segregated into smaller areas with a handful of dogs of similar size in each pound so smaller sized dogs weren't dominated by too many bigger dogs and there were internal spaces and housing so the dogs could find their own spaces. We were allowed to leave Zina at the centre to acclimatise for an hour or so a few days prior to the trip, which settled our nerves and meant it wasn't so strange for Zina. It also meant we could see how well the staff treated the dogs and their care and attention. And while dogs are never keen on going to kennels, when we got back at the end of the trip Zina was being sociable with the other dogs in her area and looked very fit and healthy with no signs of problems or trauma. Definitely a dogs kennels to be recommended. 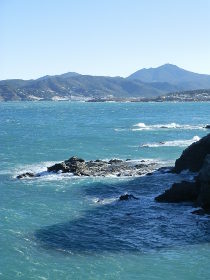 Llança is in the northern part of the Costa Brava between Cap de Creus and France. 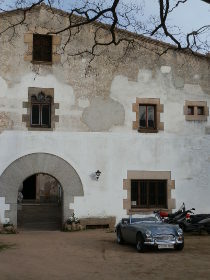 It is on the train line from Figueres to Cerbere and so easily accessible by public transport. Until recently this was the only trainline out from Spain to France on the Mediterranean side but from Llança north it is a slow and steady journey along the coast. 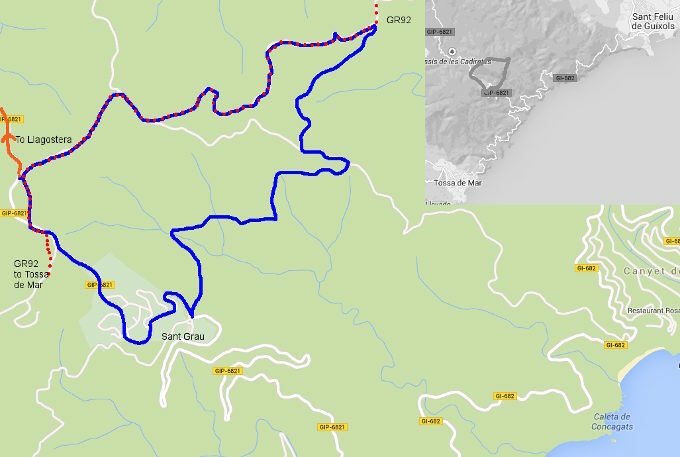 There is also a road that follows the coast, weaving and bending with the rugged coastline by hills of low scrub and olive groves - again not a journey if you want to travel quickly. Llança, like it's neighbour Port de La Selva, has the feeling of a harsher landscape than the gentler fields and welcoming calas further south - there is an air of untamed wildness in the scrub-covered hills and the rough rocks that jut at angles leaving sharp edges. The sand is dark grey, soft in places, but pebbly in others. This wildness which was increased for us by the strong wind and white horses on the sea and the fill of driftwood from the recent storms that scattered across the beaches. We're a little behind on our walks over the last month. The early part of November was unseasonably hot, with people sunbathing and swimming in the sea in the first week of November. And then rain and fog came (including floods in Figueres) which, combined with being a taxi service for some very active children, meant that we've been walking closer to home and revisiting walks we've already added. This weekend though, blue sky is back and the autumn temperatures have returned to something normal for the time of year (more 14-17C) and for the first time this autumn we have our mountains back - the crystal clear views to the Pyrenees that we get once the dusty haze of the summer blows away. There's snow too. 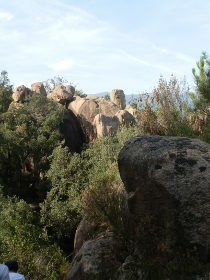 Canigou's white top can be seen from the Palafrugell to La Bisbal road again. So we're up to visit Llança. The town is slightly separate from the port, so we park near the Port in a strong Traumuntana wind which is whipping up the sea. From the car park we walk to the sea itself for some bracing sea air, then follow the promenade past the modern houses which faces the nest of buildings of Port de Llança and the small marina in front of us. Behind us, the hills climb to the back of the housing estate and along the coast we get views of the windswept headlands towards France. And out at sea there are some hardy souls on jetskis using the rough conditions for jumping. A bridge crosses a small river into the bay of the port, which has a crescent shaped sandy beach in the dark sand typical of this area. Ahead of us is a small hill (the Castellar) with a number of people out for a breezy sunday afternoon stroll. 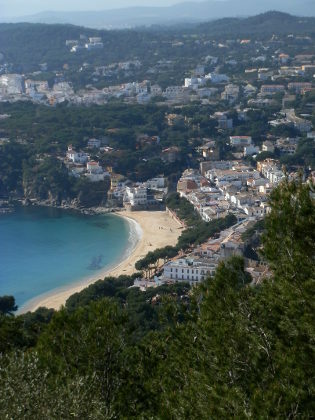 We walk up the hill and get views up the coast to Port de la Selva. The village of the Port is separate from the main town of Llança and consists of a small nucleas of houses, bars, restaurants and shops that climb up on the headland. There is a marked coastal path (green-red), however from the port side closest to the sea, the route has been blocked, so we have to navigate through the streets up the hill of the headland. At the top we find the path continues above the cliffs with pre-prepared steps, but the wind is sufficiently strong that we actually stick to the estate roads among the houses and villas until we reach a lower point (it's not particularly high, but the wind was quite fierce). After curling through the streets we navigate back towards the sea and reconnect with the coastal path, following it around the rocky headlands. The stones and rocks in this area are quite dark and jagged with sharp corners so we stick to the path. It follows around a number of small bays with beaches of grey sand in places, pebbles in others. The storms have brought driftwood in to the bays and they are littered with trees and branches washed clean by the sea, lying among seaweed that lends a nautical smell like an English beach. The path is undergoing some recontruction, but we walk round with no problem coming to Platja les Tonyines before turning back to the town above Cala de la Loup. We walk the straightest route to town along a relatively plain street, heading directly for the church. The inner part of Llança has a core of small streets, in amongst shops and a commercial district. The church is quite grand and stands next to an old Romanic tower in a placa in the centre of the town. We're suffering from wind noise and so don't explore too much, but instead head back to the port. 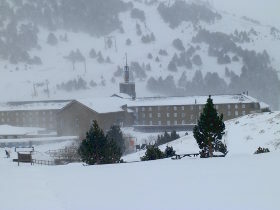 Andorra is one of Europe's smallest countries, located in the high Pyrenees between Spain and France and known for cheap skiing and duty free shopping. 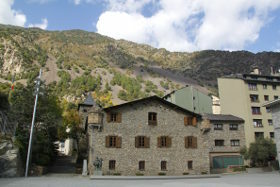 From Barcelona, Andorra can be reached in about 2-3 hours, but it's a little further from the Costa Brava as the most direct route along the foothills of the Pyrenees is relatively slow and windy. 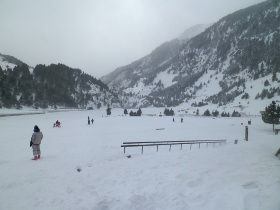 Andorra has a certain novelty value because of its size and there is a steady stream of traffic that passes through just to see what it is like - from both France and from Spain. We've driven through about three or four times, but not really stopped - so it can seem like just one road with few shopping centres at one end and a few ski resorts at the other. However, the last weekend my son had a handball match against an Andorran team with a bus to take us, so we took the chance to explore a little more. 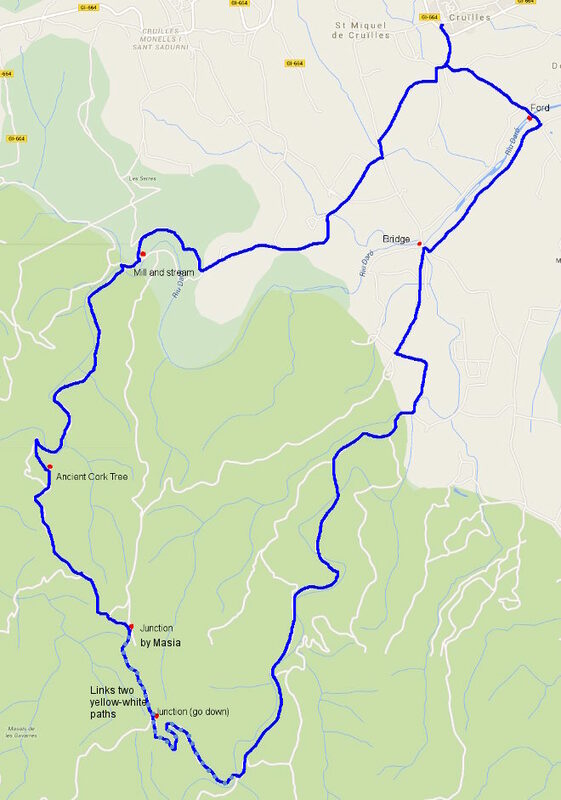 The journey up to Andorra from the Costa Brava is relatively long as the best route goes via Vic, then connects with the main road from Barcelona to Berga, the Tunnel of Cadi to La Seu d'Urgell. Our journey by bus took four and a half hours including a brief stop at a service station outside Vic. The landscape on the journey is quite varied. 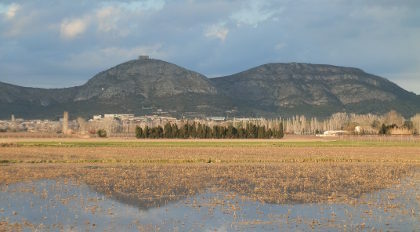 The plain of Vic up to Berga is quite a harsh dry type of terrain, then from Berga north it becomes more vertical and mountainous past the spectacular lake at Cercs before going through the Tunel de Cadi (this has a relatively expensive toll). On the other side of the Sierra de Cadi the landscape is transformed to soft fields and pasture to La Seu d'Urgell before climbing up to the frontier. As we arrived, it was a great surprise to run into traffic jams on the road up to the border. Partly this were some spot checks by the local police, but there was also quite a lot of traffic. 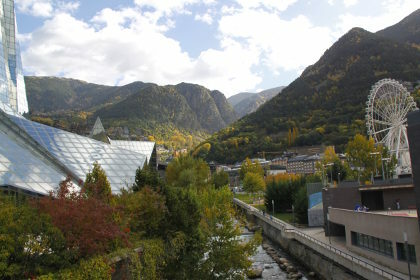 Andorra, being a duty free zone, attracts many visitors and shoppers who travel up from Barcelona. 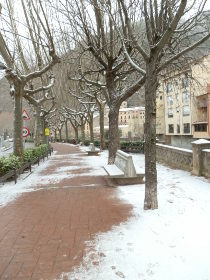 The bus dropped us in the centre of Andorra la Vella so that we had a couple of hours to explore before the match. 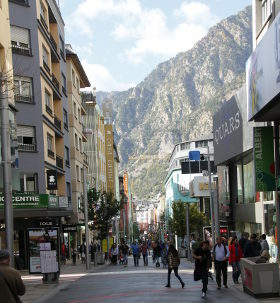 Andorra la Vella is the capital city of Andorra and has become wealthy as a tax haven for Spain and as a location for tax-free shopping. Most of the city is therefore modern and commercial with many private banks, jewelry and electronics stores, fashions and of course, tobacco and spirits outlets. The city sits in quite a vertical narrow valley with mountains all around and though there were some lovely autumnal colours on the mountain-sides, the setting is not particularly picturesque. There is a river and older parts of the city that can seem a little lost among all the new buildings and villas clinging to the sides of the hills. 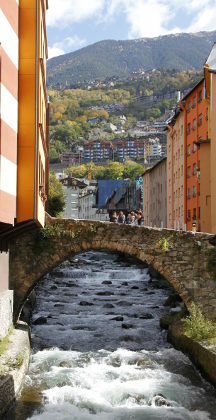 The northern part of the city is Les Escaldes with an ancient bridge and a handful of older buildings by the river. Then following the river downstream you pass a large glass and steel centre before coming back into the main commercial axis. The commercial areas of the city are mostly pedestrianised with a number of large malls and shopping centres. If you are shopping, it's important to realise that this is a genuine old-school duty-free area. That is there are restrictions on how much you can take back out into Spain (or France) and customs and police regularly do spot-checks as you cross the border. 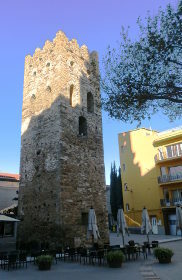 The heart of the old part of the city is further towards the frontier above the river area with a small church, a small castle and a handful of older buildings. Almost like a Catalan village surrounded by modern apartment blocks and buildings. This is also the only country (currently) where Catalan is the national language and you do see signs in Catalan around the town. 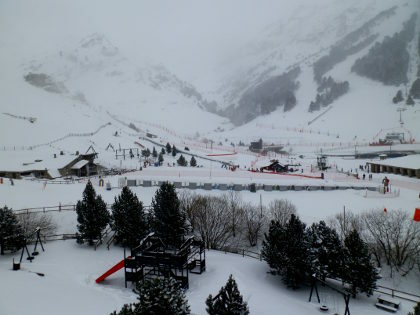 There is also a strong French influence and because of the skiing, a number of English bars around town which gives Andorra more of an international feel. Our overall impression is that there's a novelty in visiting once but that, unless you're into skiing, with the long journey it's not a place we're drawn back to. Autumn's beckoning and as has become an annual habit we head to Montseny - this year to Santa Coloma de Farners just to the South West of Girona. It's a town we've visited several times mainly for the walk in the hills to the Ermitage that looks over the town and the wonderful autumnal park of Sant Salvador - a glorious crunchy leaves and dappled sunlight type of park that runs along the river. This year October is proving to be surprisingly warm - 26C or 27C. At the coast people are still swimming, let alone sunbathing. Inland at Santa Coloma the temperatures are also warm so rather than walk to the Ermitage we take a shorter route around the unusual rock formations of Roques Alls. We park in the centre of the town and for the first twenty minutes or take a short walk through the town streets which, being Sunday, are pretty much empty of people. 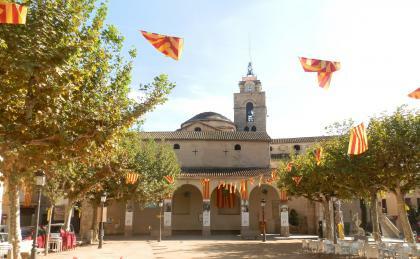 The main placa for Santa Coloma is just the other side of the church and has been decked out with Catalan flags. 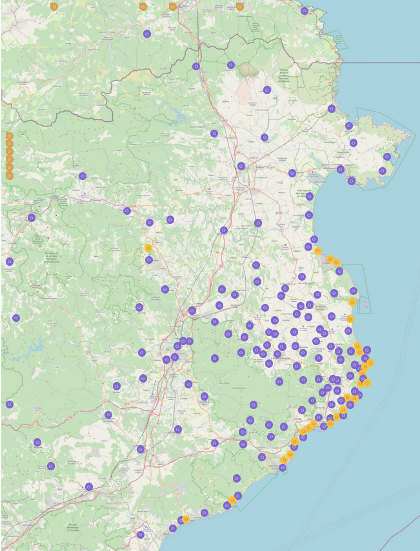 We're between the Diada (11th September) and its massive demonstration for Catalan independence and the impending date of the Vote for the Consulta which will ask Catalan people whether they want to be independent or to have more autonomy within Spain. From the Placa we walk up to the Carrer Dalt (upper street) just above the town with views across to the hills and Montseny in the direction we'll be walking. The street isn't too long and we soon come back into town and then find a path past allotments to the main park of Sant Salvador, crossing the river by a small footbridge. 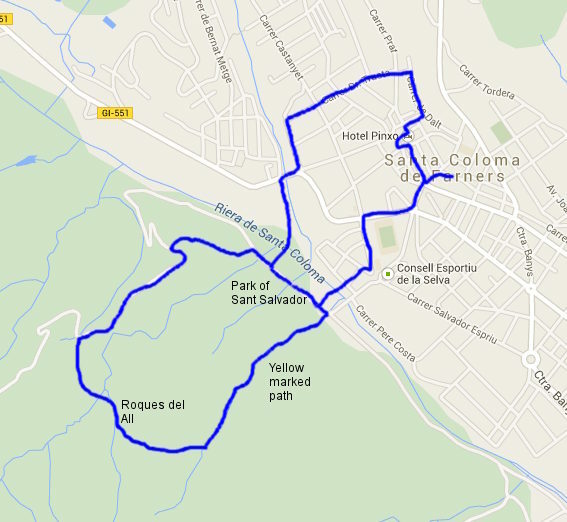 The park is a highlight of Santa Coloma, tall trees planted in formation rise above a flat grass area next to a wide, but shallow river. The autumn light piercing the leaves leaving pools of illumination in among the shaded paths. 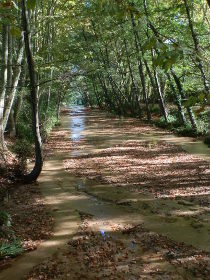 The paths are patterned with leaves that crunch under foot, while it's still warm enough for children to be splashing in the river shallows. The park is quite large, running along the river for about 1000m and includes a playground and a natural water spring that people visit to fill up water bottles making it a great place for a picnic or to bring younger children. We head up though, taking a path on the far side of the park from the weir/waterfall. There are a number of routes into the hills and our path quickly narrows, following what would be a torrent (a steep dry stream bed that channels water when it rains). It's not too far and we emerge at the base on large bare rocks and boulders. 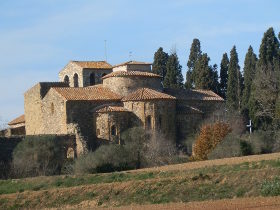 There are views from here across Santa Coloma and out towards the plain of Girona. We continue to head into the hills and then follow the signpost for Roques Alls - more rocks, some which look like they're balancing precariously above our heads. The path is a bit of a scramble between the boulders into a narrow gully, then up and out the other side emerging at another view point. Our walking path then connects with a dusty gravel road track and we start to head down, but rather than keep to the road, we take a different path to the right and curl our way back down the hill to the park and back through the town to the car. 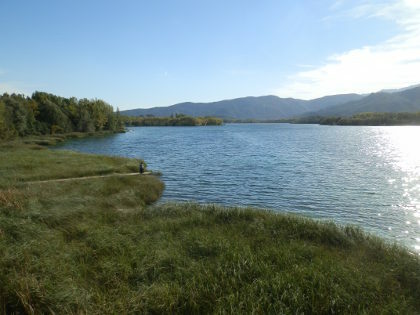 The Lake of Banyoles is the largest inland freshwater lake in Catalonia and is situated about a hour from the Costa Brava. The lake and town are surrounded by wooded hills and make for a perfect Autumn stroll in amongst the golden leaves as the trees turn colour. We park by the main sports centre where a festival or function is taking place, then walk across the paths through the sunken meadows to the side of the lake. The lake is about 5-6km around the outside so an easy flat stroll, but a large enough lake to really enjoy the water and views. 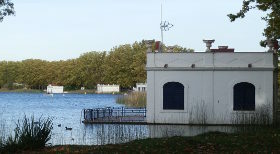 The lake itself has a number of boathouses that jut out into the water in fanciful shapes like castles above the water. We walk away from the town to start with towards the more natural end of the lake. 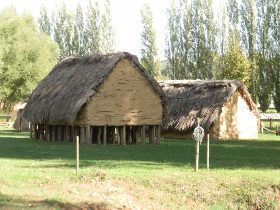 This takes us past the reconstruction of a neolithic village that has been created to show how Banyoles' history goes back in time with exhibits of wattle and daub houses raised on stilts to protect them from flooding. Our path continues around the lakeside into the woods which gleam in green with the light coming through the trees. We have our dog and given we're in natural woods its disappointing that she can't come off the lead, but that's also a challenge with a popular walk for families. The woods are full of ferns and water channels feeding into and out of the lake. And then we emerge at the other side by a sea of reeds and a modern wood design observation tower that's open for visitors. The extra height doesn't change the view too much but we can see the tourist boat on the lake taking tourists for short trips on the lake (€7 per person). Our path continues past the top of the lake and past the first of two bathing areas we would pass. 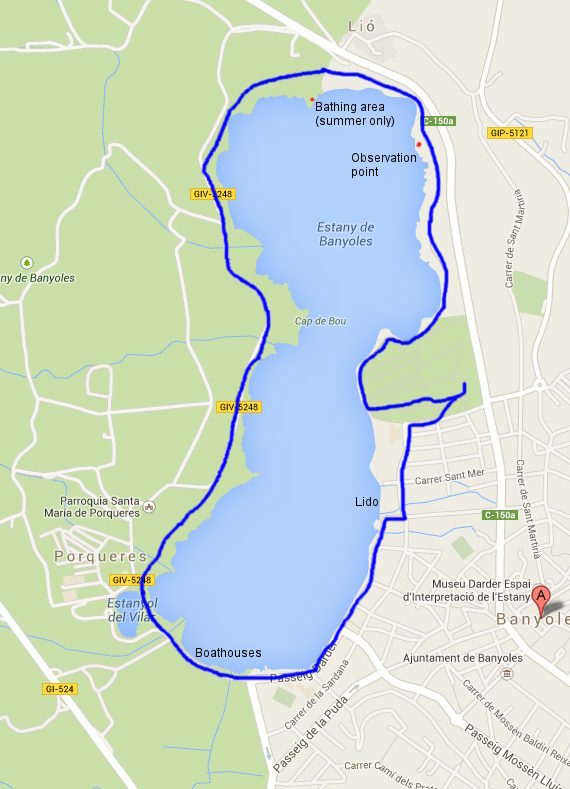 This one is natural and open, but swimming is only allowed on the lake in July, August and the first parts of Septmber. 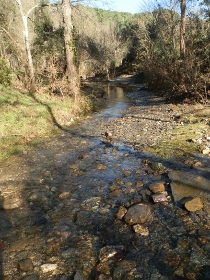 We cross over a number of small streams that either feed or take water from the lake. The meadows are full of a white daisy-like flower that grows almost on vines. We turn down the other side walking back in woods but with the sun in front of us. The occasional side path runs to a jetty or the waters edge. After a brief while the path emerges by the side of a a road and continues along the roadside (separated and a proper path) until we pass the chapel at Porqueres. For this part of the walk we can see the water through the trees, while on the other side of the road are freshly ploughed fields with a rich deep brown soil that seems to extend up to the hills in the distance. 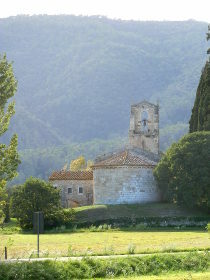 At Porqueres we get to the small church of Santa Maria and back into a more developed part of the lake with a campsite (still operating in October) and meadows that run to the side of the lake under a boulevard of plain trees. Along the edge of the lake we can see more of the boat houses and as we walk the area slowly becomes more commerical with sports stadium and bars and restaurants, and also more people walking and enjoying the sun. This is also where visitors can take a rowing boat or catch the boat trip on the lake. 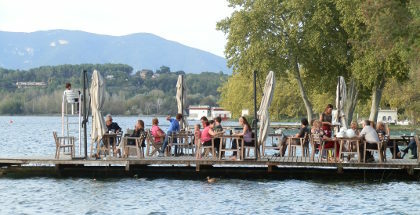 If you want to stop and take a drink or something to eat there is a small bar or restaurant built out over the water. 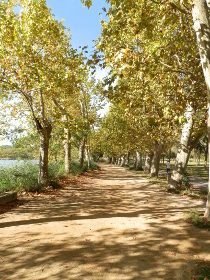 The path continues along past the boat houses until we reach the large installations of the Club Natacion de Banyoles - a swimming and sports club and also the location of the second lido on the beach, but this time more private. The sports club is large with boats, an indoor pool and tennis courts and has to be negotiated around the back. Then it's back along by the sunken meadows - presumably sunked to act as flood controls, and back to the main sports pavillion. We never did know what the event was. 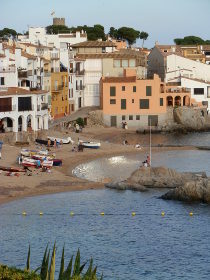 Calella de Palafrugell's Cami de Ronda on the Costa Brava is a short classic holidaymaker's walk with views over Mediterranean and hidden rocky coves, but enough interest to still be delightful as a regular walk for locals in and out of season. The walk is part of one of the earlier walks we did starting at Mont-ras, but this time we want to include just the Cami de Ronda part. 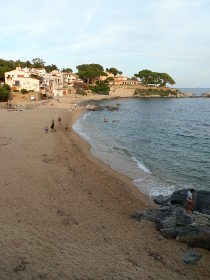 Our starting point is at the beach of Golfet, the fourth (or so) of Calella de Palafrugell's beaches and the one most distant from the centre. 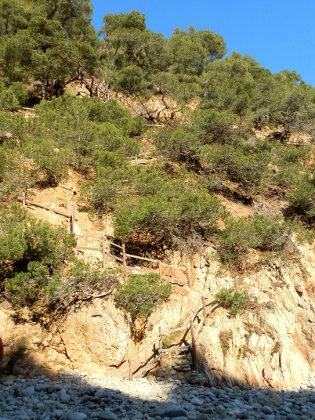 Access to the beach and path is down steps from the upper road towards Cap Roig botanical gardens and is clearly sign-posted. The steps down actually get to the path about 100m along from Golfet, so to make a full route we first go to the beach of Golfet itself, empty now in October. 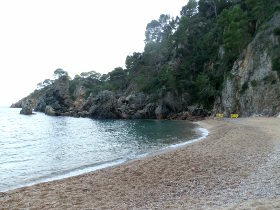 The beach is grittier and pebblier than the other village beaches, but sits in a natural cove with cliffs behind. In summer it's the quiet beach to get away from the crowds. In October there are signs of work to stablise the cliffside as it's situation also means erosiion and natural forces at work. From Golfet the path passes past two large imposing isolated rocks before running into the first of a number of tunnels. The path is extremely well maintained and not a wild walk by any means, but as the path runs along the coast it still feels like an unspoilt walk. Each bend brings a new rocky bay, or you can take in the views of the red stone cliffs that give Cap Roig its name. The path is popular as a walk and even in October there are sunbathers and people who look as if they have just come out of the sea taking a stroll. We pass a few more tunnels and out to see we get to see the small islands of Les Formigues (The Ants) marked by a low light house. The Formigues claim to fame was as the location of a naval battle between Catalans and the French in the 13th Century as part of the Aragonese Crusade when the King of Aragon was in dispute with the Pope. 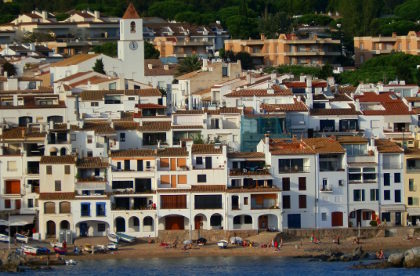 Now, in summer Calella de Palafrugell has a long distance swimming race to the Formigues and back - it's a long way 5-6km in total, so not to be tried without support and assistance. 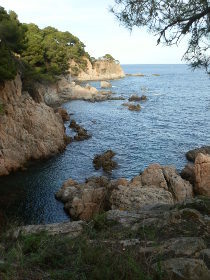 From the last long tunnel we get our first real view of Calella de Palafrugell in the autumn sunshine. The town is much much quieter than in summer and some places do close up, but the main restaurants by Port Bo tend to stay open year round. In October the bay is empty of the boats that normally moor here in the summer and the fine light makes it easy to take picture postcard type photographs. The path curves up briefly to the road at the top, before cutting down more stairs into and then up and out of a small bay. We've now reached Hotel Sant Roc and the terrace restaurant that looks over the town where dinners are just finishing lunch. 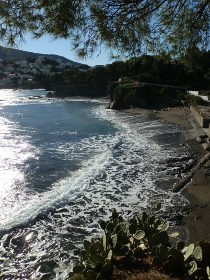 The path now turns into a promenade along the tops of the main beaches of Port Pelegri by Hotel Mediterrani. The warm day, even for October means there are still people on the beach even in the afternoon, though no-one actually swimming. The promenade walk runs down to sea-level at the heart of the village by Port Bo and its beach. People are sitting on the boardwalk by the restaurants and enjoying the views out to sea and out across to the path we've just walked. We follow the boardwalk past the old fishing boats on the beach and the old mini-harbour in the rocks. The path then cuts through the houses and we emerge with a view of the beach of Canadell. 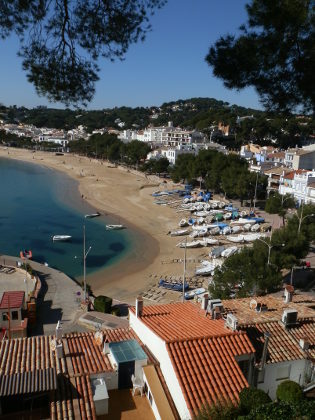 with the modernista buildings above the beach and the views to the headland that connects to Llafranc. 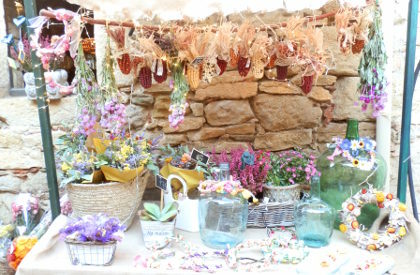 In the first weekend in October, Peratallada - one of the prettiest villages on the Costa Brava - holds a medieval fair with stalls and troubadours and festivities. 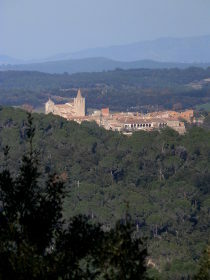 It is very popular, so rather than try to park at Peratallada, we decided to start from Canapost and take a walk through the woods. We park in the centre of Canapost just opposite the old church. The village positively glows in the autumn sun with radiant golden stone houses. 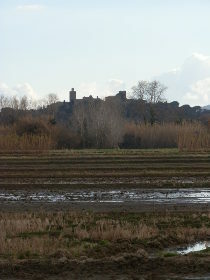 It's not far to Peratallada - about 2km on a straight path - but we're looking for a walk before the fair. We head out of the village on one of the apparently main roads and follow it until it merges with a river bed and then rough rocks that we need to climb out of to reach the track at the top. The path takes us along the edge of woods with views towards the Gavarres to our left and not far from the Clots de Sant Julia - the very ancient coloured quarries. Our road though steadily leads away in the wrong direction for Peratallada and it's only when we past the discreet Deixalleria (village rubbish dump) with hundreds of seagulls roosting on its roof, that we find a left hand turn into the sandy woods and back in the direction of Peratallada. The woods are quite open and the track curves and loops up among the trees with routes marked by yellow and red arrows - probably more for mountain bikers than walkers. 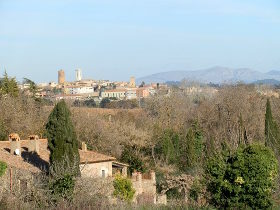 We traverse the woods and find ourselves at the top of a small hill with Peratallade down below us. 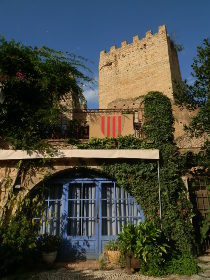 Even from the hill outside the village we can hear the troubadours playing the classic medieval sounding Catalan instruments. We come down out of the woods and into the village. The car parks are pretty full so it's good we parked away and the village itself is full of stalls and people, at times causing quite a crush through the village streets. 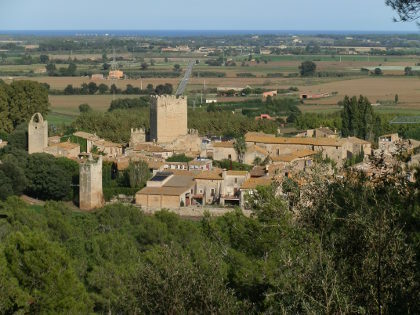 Peratallada is one of my favourite Costa Brava villages as it seems to be a place unchanged for hundreds of years like a medieval village in perfect preservation. With the fair and the stalls and decoration on the buildings and the sound of the musicians it's like walking on to a film set for Robin Hood. We also discover there are several groups of musicians - usually with one group playing, and the others taking a break in the bars. 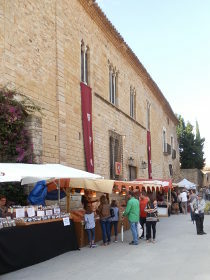 The stalls are mostly stalls of craft produce - so both handmade products like scented cushions, candles and wooden toys, but also traditional foods including cheeses, sausages (embotits) an of course wines from local vineyards. The people not walking around the village and looking at the stalls are mostly installed in the many small restaurants and bars sitting out on the stone courtyards, or under archways or on the terraces. We leave and continue back to Canapost, but taking the shorter more direct route out along the path that curves around by fields returning to an empty Canapost which looks as if it hasn't changed for centuries.